You will never go back to a regular belt again. Good products start with high quality materials and smarter engineering. No Holes in your belt. All belts utilize proven automatic buckle technology that consists of a hidden track sewn into the back of the belt, giving you over 40 adjustment stops at ¼” increments. The buckles are designed and engineered in California to include an updated version of the ratcheting mechanism which holds the belt precisely where you want it. GoTo Belt buckles are cleaner, sleeker and lighter than others that have been around for decades in other parts of the world. The combination gives you incredible control and an exact fit no matter which way your weight is fluctuating. Your GoTo Belt will always match your waist perfectly. - Sport Casual Belt Construction - On the front side of the belt you will find a durable 100% polyester fabric, On the back side of belt you will find a flexible synthetic polymer blend with a polyurethane coating. 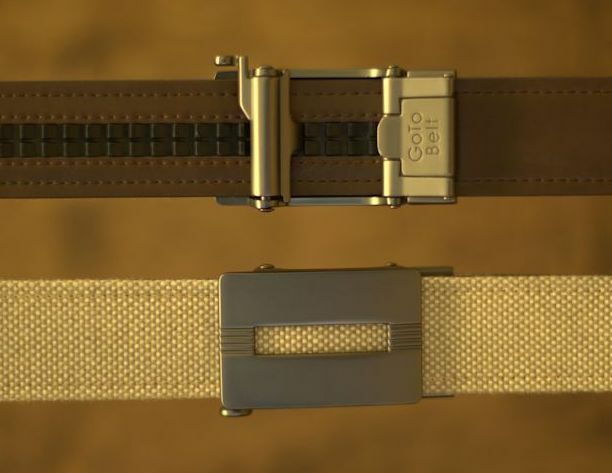 The belts are fully customizable so one size fits all waist sizes up to 44”. Belts are 1.25” wide and have no holes to wear out or stretch. These belts will give you that grin of satisfaction - and keep your pants up, with style. My husband loves his belt. We just got another for my nephew who is graduating this year. One size fits all makes it a perfect gift. Click the button below to add the DEL MAR Buckle and Sport Casual Belt to your wish list.